I was born on a farm in Ohio December 6, 1865. Desiring to move westward the family migrated to Kansas where farming conditions were better. However, renting a farm usually meant a lot of hard work with a scant living. We heard of a chance to own a home--not buying one--for we had no money. The government was opening up a wilderness country for settlement. This was Oklahoma where we had a chance to make a home. In September 1891 we left Kansas to make the run for new homes in the Iowa-Sac and Fox opening. The party consisted of my brother William and myself. We camped in our wagons six miles east of Guthrie where we waited for the date of the opening. On September 11, 1891, we camped in our wagons six miles east of Guthrie where we waited for the date of the opening. There were a great number in this race. among some of these were W. P. Goble, John Miller, W. B. Lillibridge, Frank Burris, George Greathouse, Dave Skeels, Newt Barnes and many others. Crossing Deep For from the south there was a scramble in crossing. Deep Fork was a crooked winding stream with many sharp bends. The water was fairly clear at that time. The banks were steeper and the stream deeper because the land was no plowed up and sand was not washed in from cultivated fields as it is today. Some places the stream was shallow and some places very deep holes of water were found. Crossing with wagons and stock was quite a job as there were no roads or bridges. Some people were in wagons, buggies, horseback, muleback, oxen and many on foot. Climbing a steep hill a woman afoot jumped on behind the saddle of a horse-back rider and continued the race at a faster pace. I arrived on the NE quarter Section 26-E, 15N-R.3E and staked my homestead at 5:00 p.m. September 22, 1891. Then I pitched camp and shot a wild turkey which was prepared for supper. The next day was spent locating corners, then I went to Guthrie and filed on my homestead. Spring came and time to start growing food. This season I had 10 acres broke out with a team of 10 oxen. The evening of the Chandler cyclone I was working on my cave and I saw the black cyclone cloud in the direction of Deep Fork and going toward Chandler. As I was six miles northwest of Chandler I did not know of the horrible thing that happened. That night Mr. McCaw came riding up the road calling to everyone within the sound of his voice, "Chandler is blowed away." I drove into Chandler finding a terrible sight. Many men, women and children, killed or injured. Others were walking around in the street, some were searching for friends. Mrs. Barker set up a stand on the sidewalk serving hot coffee. A horse and buggy at a hitching post in front of the old wooden court house was blowed away and the next morning was found on the east side of Chandler. The Filtsch hardware store had purchased several new wagons which were lined up in front of the store. They had sold one which they had taken an old wagon as a trade in. The old wagon would hardly stay together. The iron rims were loose on the fellas and the spokes were loose in the wheels. This old wagon set between to new wagons. The old wagon was not disturbed by the storm. The two new wagons on each side did not fare so well. The spokes were twisted out of some of the new wheels--literally splintered. An iron bolt 8 inches long was driven through a white oak tree by the wind. Blades of grass were driven by the wind into trees like nails. The Nash residence was blown into the air and landed in a lumber yard. Emma Nash was in the house at the time but was not injured. At one time there was a village or settlement of Indians in the northwest part of my homestead. Wooden racks were found with dried meat. There were some wild animals found: Wildcats, deer, wolves, wild turkey and occasional lions. Hundreds of copperhead and rattle snakes lived in a rocky canyon on the Andrews homestead in the northeast corner section 25-E, 15N-R, 3E. Many hogs, horses and cattle were bitten by these snakes. One day was set aside as snake day. People came from far and near organized a snake hunt in this rocky place. One hundred dead copperhead snakes were counted at the end of the day. My best land raised a bale of cotton to the acre. The land was fertile and plowed deep. Many hours were spent in the fields. We worked not only daylight to dark but I have plowed many times also by the light of the bright full moon. Freight was hauled from Shawnee and Guthrie to Chandler. It was about a four day trip to Guthrie and return, camping out on the way. We made the trip in all kinds of weather, never waiting for fair weather. We made our own roads or trails, taking off through the blackjacks where ever we could get through the best. I made my coffee in a gallon syrup can kept for that purpose. The old train run near what is now Carney then westward near Dudley and winding towards Guthrie. My wife Maggie worked in the cotton fields as well as helped with the chores and it was not long until we had a good home and a nice farm. It was due to her hard work and loving help that we were able to have such a happy home. Two boys were born in this home, Joseph and Eddie. Gale Hobart was one of the pioneer preachers of the Oak Grove community, highly respected by all who knew him. He asked no financial help and was self supporting by his own farm near Ida postoffice, Section 19-T, 15N-R, 4E. The community was better because of him. The Choctaw railroad built a railroad from Chandler through Guthrie to Kingfisher. I got a job working on the road bed. It was a good job, working shorter hours than on the farm. I got $2.50 per day with my team of horses for 10 hour day. No coffee breaks or rest periods. The railroad afforded a lot of work of a lot of settlers. When the road was finished a little steam engine and baggage car and wooden passenger coach was put into service, making the round trip in one day, going to Guthrie 8:00 a.m. and returning about 5:00 p.m. The terminal was first at Guthrie then later the road was extended to Kingfisher. The road was so rough, coal was often scattered along the roadbed, which was sometimes gathered by the farmers for fuel. The fireman would sometimes throw coal at the cattle to get them off the tracks. The little engine often caused fires in the fields along the right of way, doing a lot of damage. Community stores were built up to serve the public along the route. A general merchandise store, post office and blacksmith shop was built and run by John Shoop on the southeast corner of my homestead. This was called Lowe, Okla.
Coffee was wholesaled by the coffee barrel and then sold to the customer by the pound in roasted coffee beans. Everybody had his own coffee grinder and enough was ground for one meal at a time. Every family made their own butter with a churn and moulded the butter into one-pound wooden moulds. These one pound cakes of butter usually weighed 18 ounces or more. After living in the log house a few years I built the present house, which still stands. I hauled the lumber from Guthrie, which was cyprus timber. 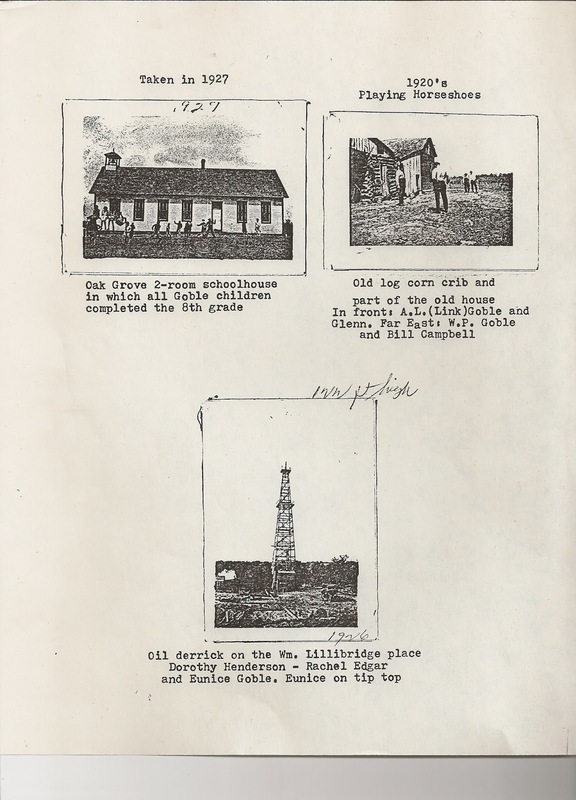 A combination school and church was built out of logs in the southeast corner of Sec. 32-T, 15N, 32. This was named Oak Grove. Both whites and colored used this school house, all students walking to and from school. Some of the students were grown up or adults. There was a large attendance, except during cotton picking season when almost all worked in the fields. In 1900 a new school house was built in the present location, the southwest corner of Section 24-T, 15N-R, 3E. This was equipped with new coal oil lights. 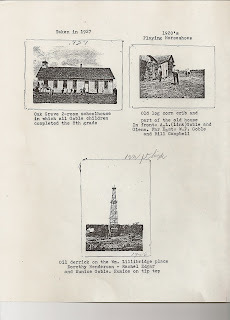 M. Hallock had a water well machine and drilled most of the water wells in the Oak Grove community. I was a member of the Anti-Horse Thief Association Lodge No. 52. The number was branded on the horses’ front hoofs. The association was very active and all members were diligent in this work. I have lived on my homestead continuously for 67 years and still live here. As far as I know I am the last remaining homesteader who made this run of this Iowa Indian settlement, who still lives on the original homestead.